ASHLAND, Ore.– Southern Oregon University unveiled renovations and expansions on Saturday of its Theatre Building as well as a new Jefferson Public Radio Broadcast Center. 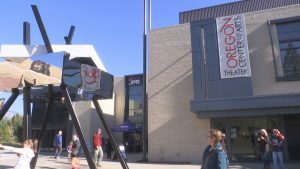 The open house showcased the updates of what has been a 10-year project which added 60,000 square feet to the Theatre Building, providing a new space for Jefferson Public Radio and a variety of new items for the theatre such as a costume shop, control booths, acting studios, and a movement studio. Community members were invited to take tours throughout the day while listening to music in JPR’s newest studio space. The station was also excited about what this new space will offer to the school and the public. The project cost about $12.75 million.